Electrochemical gas sensors are gas detectors which oxidize or reduce the target gas at an electrode and measuring the resulting current of the target gas. Globally, increase in the demand in oil & gas industry, and stringent government safety regulations are the prime growth drivers of global electrochemical gas sensor market. In addition, increase in adoption of wireless gas sensor, and rising demand in emerging economies such as China, India and others will create new opportunities for global electrochemical gas sensor market. However, issues related to size, energy consumption, and sensitivity is the key restraints for global electrochemical gas sensor market. This report identifies the global electrochemical gas sensor market size in for the year 2014-2016, and forecast of the same for year 2021. It also highlights the potential growth opportunities in the coming years, while also reviewing the market drivers, restraints, growth indicators, challenges, market dynamics, competitive landscape, and other key aspects with respect to global electrochemical gas sensor market. Geographically North America dominated global electrochemical gas sensor market, and Asia Pacific is projected to have fastest growth, owing to rapidly increasing aging demand for automobiles, consumer electronics from countries such as China, India, and South Korea in this region. 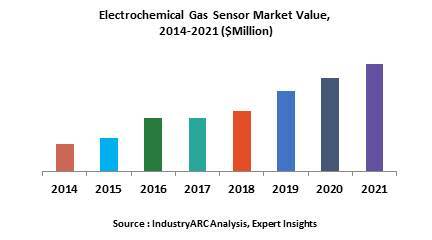 Among all the end-users, industrial segment has the highest market share in global electrochemical gas sensor market.